The Sureflap Microchip Cat Flap has been developed to only allow registered pets to pass through and stop unwanted animals from entering your home. Designed to read common identification chips and RFID collar tags, the door can store up to 32 pet identities in its memory and only has selective entry; any animal can exit safely. Simple one button programming and a manual lock to stop your cat leaving or entering your home gives you complete control over the cat flap at all times. 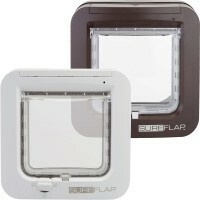 The Sureflap Cat Flap has an easy to install two part construction which allows it to be used as a drop in replacement for many existing cat flaps. It can be installed into most doors, windows and walls.